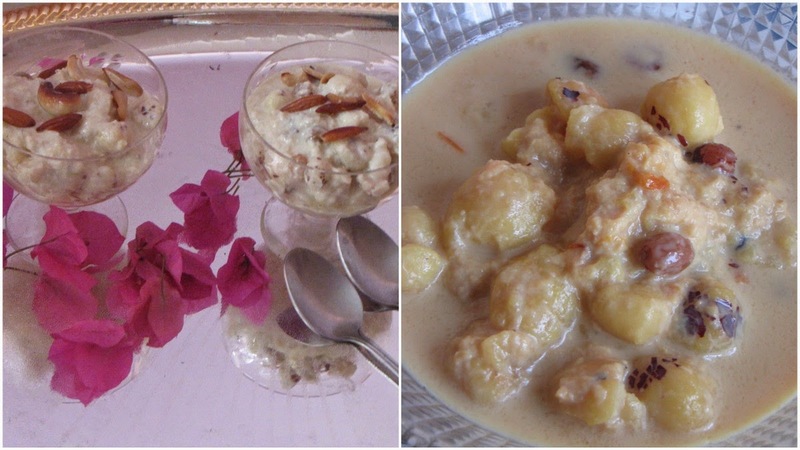 Today’s recipe is of a kheer that’s made often in most Indian households. 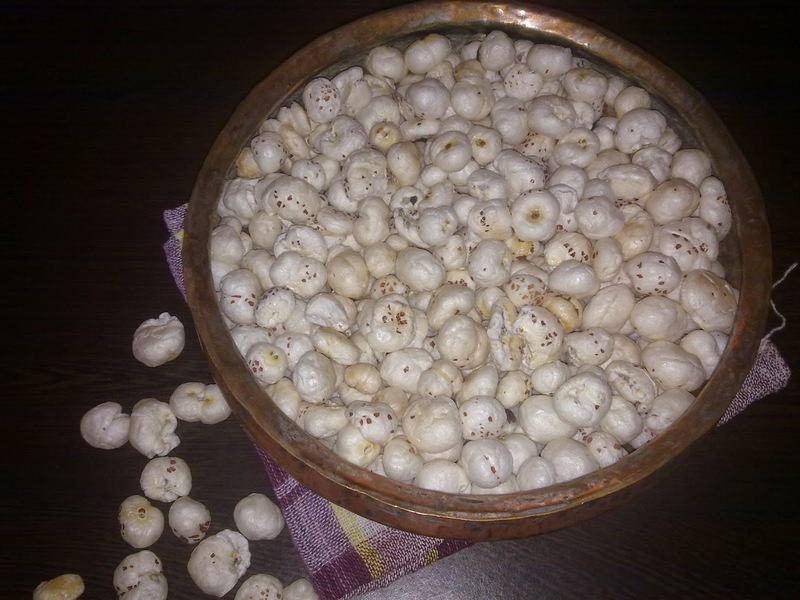 In summer it’s eaten chilled and in winter it’s served warm.For years I had thought that makhana were lotus seeds but a recent Google search made me realize that the seeds actually belong to the genus Euryale. These are also known as fox nuts/Euryale ferox and is said to have many medicinal properties. The plant is also known as the Gorgon plant. Here’s more from Wiki. Euryale is a perennial plant native to eastern Asia and found from India to Korea and Japan as well as parts of eastern Russia. It grows in water and produces bright purple flowers. The leaves are large and round more than a metre across with the leaf stalk attached in the centre of the lower surface. The underside of the leaf is purplish while the upper surface is green. The plant is cultivated for its seeds in lowland ponds in India, China and Japan. In the northern and western parts of India the seeds are often roasted and fried and eaten with a mix of oil and spices.. These are then eaten like popcorn. The seeds are also used as “prasad” (religious offering). A little makhana goes a long way!! ~Heat the milk on the stove till it is reduced and becomes thick. The cardamom pods can be added too. ~ Roast the makhana in ghee and remove. ~Add them to the milk after crushing a quarter of the seeds. This will help in the thickening process later. ~Let it cook for a while then add the condensed milk. You could increase/decrease the amount depending on how sweet you usually have your kheer. Alternately, you could also use sugar or jaggery. ~Add the saffron, stir. Let it cook for a little longer before removing from the flame. It should be of regular kheer-like consistency and will thicken a little more as it cools down. ~Add the flaked almonds. Cool/chill before serving. ~ If using raisins, they can be washed, patted dry and shallow-fried in a bit of ghee before cooking along with the kheer.